BleachHouseLibrary.ie: "The Easter Rising 1916 - Molly's Diary" by Patricia Murphy. Review by Mia, aged 11. "The Easter Rising 1916 - Molly's Diary" by Patricia Murphy. Review by Mia, aged 11.
Review by Mia Madden, aged 11. This book is part of The Hands on History series from Poolbeg. It's about a twelve year old girl called Molly, who writes everything down about the Easter Rising in 1916 (when the Irish fought to get their country back from England) which is happening around her. Her father is the Chief Technical Officer at the General Post Office (GPO), who is in charge of the telegraph lines. Her sixteen year old brother, Jack, is secretly a Fianna boy scout led my Countess Markievicz and is working for rebel leaders Pádraig Pearse, Tom Clarke, Séan Mc Diarmuida, James Connolly and Joseph Plunkett. Suddenly Jack disappears and Molly thinks it is her duty to find him, as her mother is in Belfast and her father is repairing the telegraph lines. Running around the city of Dublin, looking for Jack, Molly gets caught up in many big events as she's a first-aider. Because of this, she travels to many hide-outs of both the rebels and British troops, as she is healing them. But will she find her brother? I enjoyed this book, but it took me a while to get into it because I am used to reading normal fiction and fantasy books. It was great for me to read about things that I don't know about. It was a convenient read, for another reason aswell; next year is the 100th anniversary of The Easter rising! My school is going to use this book as a novel for sixth class in September, also for that reason. I recommend this book for history lovers age 10+. 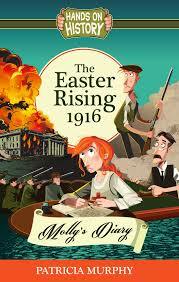 The Easter Rising 1916 - Molly's Diary is published by Poolbeg and is available in paperback and ebook format. "Freedom's Child" by Jax Miller. "Are You Watching Me?" by Sinéad Crowley. "The Bones of You" by Debbie Howells. "A Love Like This" by Maria Duffy.